On behalf of Special Frontier Force, I join Tibet’s appeal to the International Olympic Committee to block Red China from hosting 2022 Winter Olympic Games. As per conditions stipulated by Olympic Games Charter, Red China is not a fit nation to host Olympic events for she violated Human Rights of her own citizens and of Tibetan people. 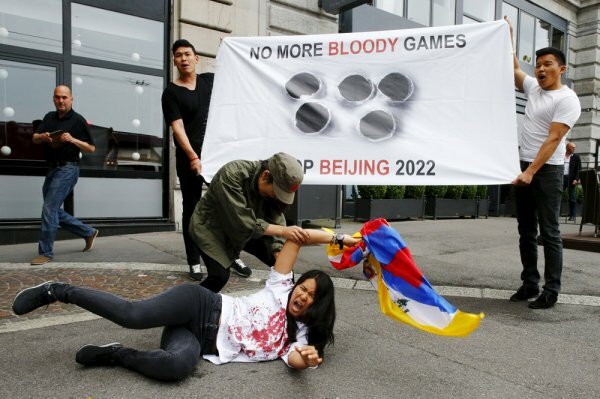 Tibetan activists and others are calling on the International Olympic Committee not to award the 2022 Winter Games to Beijing, saying China’s human rights record after the 2008 Olympics in the Chinese capital worsened rather than showing a hoped-for improvement. The IOC will choose Friday between only two cities: Beijing and Kazakhstan’s largest city, Almaty, after all other bidders dropped out for financial or political reasons. Both countries are frequently criticized over their record on human rights and press freedoms. Tibetan rights groups and human rights activists have written letters to the IOC, delivered a report to the IOC on human rights abuses and tried to disrupt the city’s lobbying to try to prevent the decision from going to Beijing as it did in the 2001 vote for the 2008 Summer Olympic Games. “In 2001 what we saw was some optimism on the part of the IOC that the games might help to improve human rights in China. Exactly the opposite happened,” said Alistair Currie of London-based Free Tibet, which is one of the groups coordinating the campaign by the International Tibet Network. Giving the games to China again is tantamount to saying “‘you are a full member of the global community, you can receive all the honors and prestige that go along with that — that will embolden its approach to repressing human rights in Tibet and elsewhere,” Currie said. “What we have seen since 2008 is that there is more repression, Tibetan intellectuals are being forcefully disappeared and the situation in Tibet is getting more urgent every day,” Golog Jigme, 46, said through an interpreter by phone from Switzerland, where he has applied for asylum. He said Tibetans faced more obstacles to traveling, even from village to village, and there was a big military presence that extended to monasteries and schools. The campaign against Beijing becoming 2022 host city comes amid a wide-ranging crackdown on civil society, or groups outside of Communist Party control. In the past two months, authorities have rounded up more than 200 “rights-defender lawyers” and the activists associated with them, accusing them of being troublemakers. Dozens remain detained and may eventually stand trial.